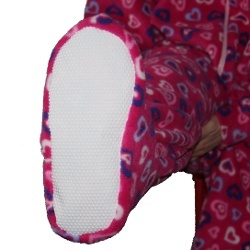 Our fleece dungarees are made in anti-pil fleece giving them a lovely, warm, soft feel. The dungarees have poppers along the legs and groin to allow opening completely. Our dungarees are loose fitting for comfort and have a matching collar and cuffs. Each fleece dungaree is made by us in the UK and is made to last. You can choose to add feet and Gripper soles to your dungarees. Classic drop seat flap with velcro fastening.